LIC E Term Insurance Policy is a protection Plan which will be available through online mode only. It is a regular premium plan which will give financial protection to life assured’s family on their sudden or unfortunate death. In this particular plan no intermediaries are involved in this plan. In this E-Term Plan the premium for the Smoker/ Non-Smoker lives varies. The proposal on own life will be considered only. Which means life insured cannot add their family members or spouse on this plan. Life assured can have nominee to this plan. Also this is very cheap plan which can be affordable by common people. Under this plan there are two premium rates available. For Sum assured up to Rs. 49 Lakhs the aggregate category rates will be applicable only. For Sum assured Rs. 50 Lakhs and above, life assured have a option to choose Non Smoker Category. 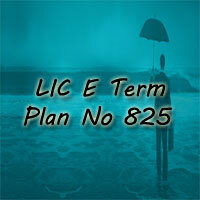 In this LIC E – Term 825 Plan, the application of Non Smoker lives will be based on Urinary Cotinine test. In all the remaining cases, Aggregate premium will be applicable. LIC E term Plan has some Key features and Benefits for the Life assured. LIC Corporation has designed a set of features under this scheme. For the better understanding of Life assured, we have provided some information regarding Features and Benefits under this E-Term 825 plan. Check the Features of this Plan, so that you can complete knowledge on this plan. If the Policyholder doesn’t pay the premium within the time, the company will extend the time to pay the premium is a grace period. LIC 825 Plan has the grace period of 30 days. Assured candidate can pay the premium within this Grace Period. If the Policyholder doesn’t pay the premium within the grace period, then the Policy will be the lapse. A lapsed Term Plan will be revived within the two consecutive years from the date of first unpaid premium. This Term plan will be revived before the expiry period of Policy term. If the insured candidate wants to return the policy within the Minimum Policy Term, no surrender value will the paid to the policyholder. If you are not satisfied with the Terms and Conditions of the Policy, you can return the LIC E-Term Plan within the 15 days from the Date of receipt of the Policy. In a case of the Sudden/ Unfortunate death of insured candidate within the Policy term the sum assured will be payable to the Assured’s family or nominees. In the case of survival of the life assured up to the policy term, no benefits will payable. The Eligibility conditions for this E Term plan are provided below. The Criteria includes Age Entry, Sum Assured, Policy Term, Mode of Premium, etc. Rs.50,00,000 for Non Smoker lives. Life Assured should NOT BE Overseas Citizen of India(OCI) or Person of Indian Origin (PIO). Insured must have own earned income. Life Assured can buy this LIC 825 policy through Online Mode only. No Mediators are involved under this plan. You should be Indian Citizen and you should go to the Medial Check ups(if Necessary). Before buying read the Features, Benefits, Premium Rates, and all other information. Visit the link http://e2e.licindia.in:8080/OnlineTerm/checkdowntime.do and fill the required information. If you are buying this policy for the first time, click on the new user and click on two options if you are resident of India. Fill the required information correctly. Because this information will be used for your proposal form and Premium calculator. A new Access ID will be generated which will be sent to your mobile Number and Email ID. Make sure that you are saving you are access ID and other important information. Finally buy the Policy using Net Banking/ Debit Card/ Credit Card. Nominees/ Spouse can claim for the LIC E Term policy after the death of the policyholder. Because there is no Maturity/ Survival Benefit under this plan. If the policyholder committed suicide for any reason within the 12 months of the date of commencement of risk or from the date of revival. The nominees will get the 80% of the premium paid till the date. No Surrender value will be provided under this plan. In this LIC Jeevan Amulya II Policy, Loan facility is not provided. No paid up value will be provided under this LIC 822 Plan. No riders are available in this plan. Medical Test: Medical Tests will be done based on the category you select. This E Term Plan should buy through online mode only. No Mediators will be involved under this plan. 1. What is the Grace Period under the product? A. LIC 825 Plan has the grace period of 30 days. Assured candidate can pay the premium within this Grace Period. 2. Can I buy it under Non-medical Scheme? A. Yes, if you are within 35 yrs. of age, with annual income > 3 lacs, you may purchase upto 40 lacs and if between 35 to 45 yrs of age, with annual income > 5 lacs, you may buy upto 30 lacs subject to you being Non-Smoker, No past medical history and underwriter’s decision. 3. What is Non-Smoker Rate? A. Non-Smoker rate is applicable for sum assured 50 lacs and above. The people who does not use tobacco in any form are eligible for this premium. For people other than Non-smoker and proposer of e-Term up to 49 lakhs, Aggregate rate will be applicable. 4. How can I pay the subsequent premium? A. You can pay the subsequent premium through Net-Banking/ Credit Card/ Debit Card.